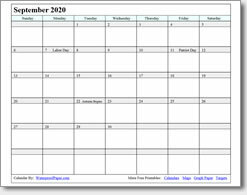 September 2019 Printable Calendar - Print as many as you want! 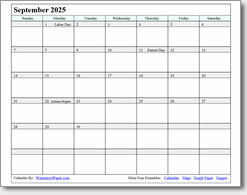 Download our free September calendars for your personal use. 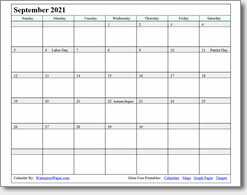 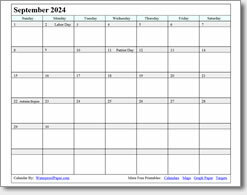 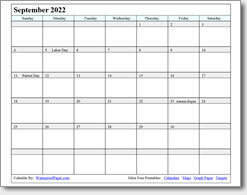 These printable September calendars are Adobe Reader .pdf files that are designed to print on a standard 8 ½" x 11" sheet of paper. 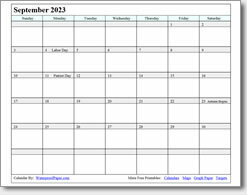 The month of September always has 30 days, and for easy reference, we have marked Labor Day, Patriot Day (National Day of Service and Remembrance on September 11th to honor those who lost their lives in the 9/11 attacks), and the first day of autumn.